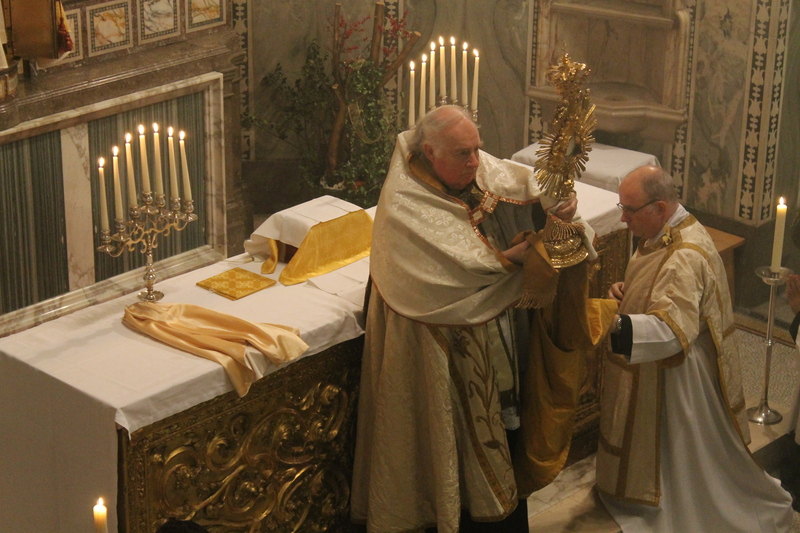 On Sunday 2 February, the Feast of the Presentation of the Lord, Fr Anthony Watkins of the Personal Ordinariate of Our Lady of Walsingham led Solemn Evensong and gave Benediction of the Blessed Sacrament at the Church of Our Lady of the Assumption and St Gregory, Warwick St (London, W1). He was assisted by Deacon James Patrick, who also preached the sermon. Music was provided by the church’s outstanding choir and included Charles Stanford’s ‘Evening Service in G’, Richard Ayleward’s ‘Responses’, Henry Balfour Gardiner’s ‘Evening Hymn’, Gioacchino Rossini’s ‘O salutaris hostia’, Maurice Durufle’s ‘Tantum ergo’ and Gregorio Allegri’s ‘Adoramus in aeternum’. The Church of Our Lady of the Assumption and St Gregory, Warwick St, is dedicated to the life of the Personal Ordinariate of Our Lady of Walsingham and is its principal church. The Friends of the Ordinariate helped promote the Service.